More protein: 13 grams per serving all from a proprietary blend providing a variety of proteins from water-washed soy, peas, chickpeas, tofu, rice, and other plant sources. More fiber: 8 grams per serving – in a healthful blend of soluble and insoluble fibers from apples, corn, rice and other plant sources. Less fat: less than one half gram per 100 calories. Less sugar: only 11 grams per 100 calories – from organic sugar cane, monk fruit, stevia and other plant sources. Fewer calories: 130 calories per servingbetter for you than just about any other 130 calories you’re likely to eat or drink. Even the carbs are healthy – 20 grams per serving: our all-natural plant sources of slow releasing, low-glycemic index carbohydratesinclude quinoa, amaranth, and millet in a proprietary blend of ‘ancient grains’ that have been cultivated for centuries. 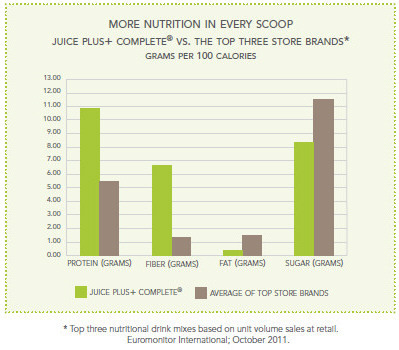 Juice Plus+ Complete also comes in easy-to-scoop stay-fresh foil pouches that are kind to the environment, too. It’s easy to mix, smooth and creamy, with a great taste – even when mixed with water, it’s delicious! Just add a scoop of Juice Plus+ Complete to one cup of cold water then stir, shake, or blend until smooth. It’s also good with skim milk, soymilk, rice milk, or fresh juice. For added nutrition and variety, experiment with other wholesome ingredients, such as fruits, berries and a few leaves of spinach, kale, swiss chard or your favorite green vegetables. 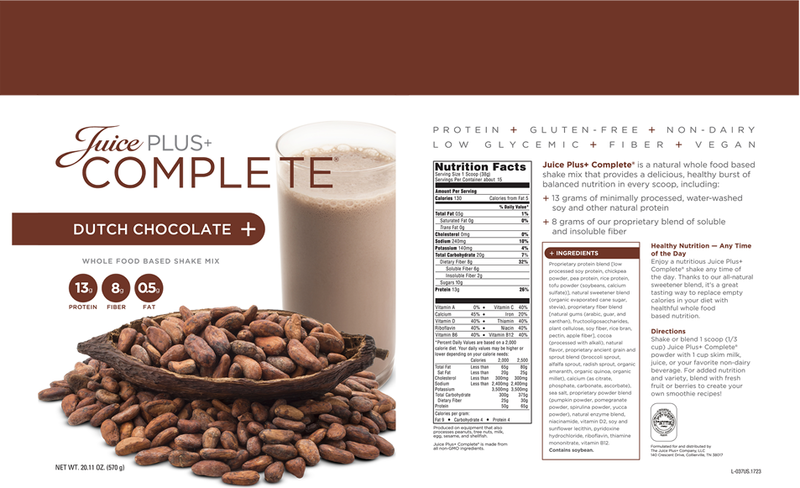 Juice Plus+ Complete costs about $2 per 8-ounce serving: it’s $30.75 a month (over 4 months) for a 60 serving, four-pouch carton. Click on the photo to see the full brochure. 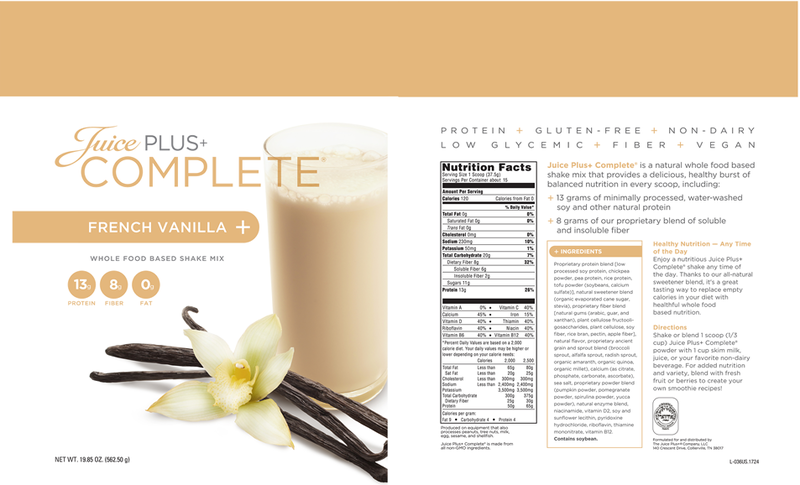 Here are the labels listing the ingredients of the chocolate and vanilla Complete. 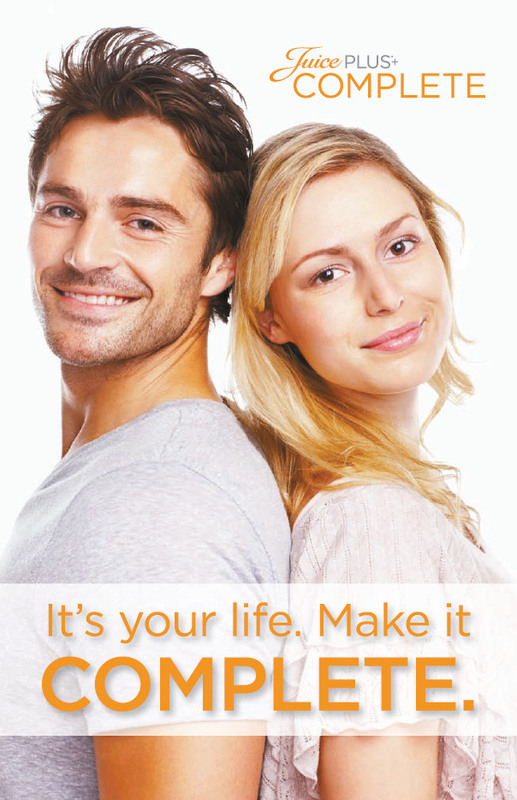 If you haven’t tried Juice Plus+ Complete yet, then now is the time! To learn more please watch several short videos and a ‘complete’ Webinar by Jan Roberto, MD and on the role of Juice Plus+ and Juice Plus+ Complete in your health, fitness and nutrition program.